All this for a stage that lasted approximately 16 seconds. Well... kinda. The replay itself lasted 16 seconds, but it actually took you anywhere from three to five minutes to complete the stage. Time and tide wait for no man, but SUPERHOT threatens this notion with its central concept of forcing time to a near halt between actions; when you move, everything else moves, and when you stop, everything slows to a literal snail's pace. For some, this might make the game seem a bit easy to get through, possibly even boring after a few stages, but the devs managed to create genuinely tense moments from this design. 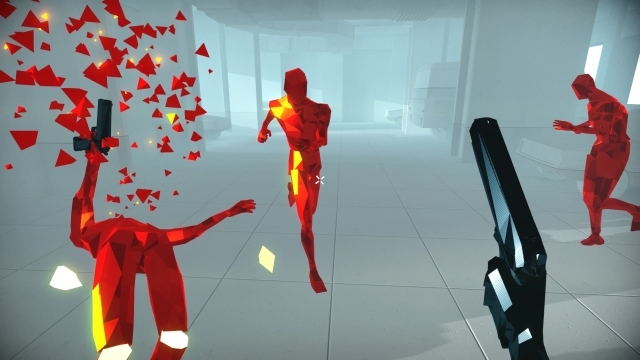 SUPERHOT starts off with simple scenarios, basic stuff to learn in "slow motion time," such as dodging bullets in a sizable corridor, grabbing pistols from enemies, and the importance of bullet and spawn audio cues. But then your opponents start carrying other weapons, shotguns, and automatics that fire a wall of bullets or in rapid succession. Considering you die when harmed once, this is cause for alarm. In some of these stages, you don't even start with a pistol, so you're forced to be more creative; use walls and pillars as a shield while you methodically make your way through a room, and also toss objects at your opponent to temporarily stun them and make them drop their weapon. But that's an example against one opponent, and more times than not, SUPERHOT throws enemies at you who literally spawn from thin air. At this point, the game is sounding less like a first-person action title, and more like a first-person puzzler. As it should. You'll be in many a scenario where polygonal baddies come at you from several directions, both near and far, wielding various weapons, and you're faced with numerous dilemmas. Can you confidentially punch a weaponless foe in front of you before a distant hail of bullets reach your location? Can you successfully shoot an enemy in the spot you think they'll run to, then turn around and hit the red figure that's about to slash you with a katana? Who knew that grabbing a much-needed pistol off the ground, knowing full well a gun just went off from behind and a bullet is flying in your direction, in slow motion, could be so intense? Though, for being so full of ingenuity, SUPERHOT never once feels as if it reaches a peak. Just when the game starts becoming truly frantic... you're given an epilogue. But it's an epilogue that feels more like the conclusion to a first act, so you're expecting more... and then credits. The biggest reason why it doesn't seem like the game builds to a climax is because you're still being attacked by the same opponent types during the final stages, only at a more frenzied frequency. Variety pretty much goes out the window at this point, with the exception of a newly-gained ability that allows you take over an enemy's body. That ability is the other issue, as it's introduced late-game and is more like an afterthought, as it doesn't mesh well with the other mechanics. If anything, the power makes the game easier, since it acts as a temporary Get Out of Jail Free card. The devs did add a bunch of bonus material that include mini-games, small secrets, and challenges, probably to make up for the lack of content in the main game. However, the most prominent extras, the challenges, are just slight variations of the main game, such as going through 25 stages using only a katana, going through 25 stages using only the body switch ability, going through 25 stages only throwing objects, going through 25 sta-you get the point. While it's disappointing the game has flow issues that make for an awkward, sudden climax and additional modes that feel more like basic "What If?" scenarios, the devs should be commended for executing a unique idea within its short, abrupt stay. In a genre known for its excess of shooters that copy one another with no regret, SUPERHOT delivers an alternative experience. If you enjoyed this Superhot review, you're encouraged to discuss it with the author and with other members of the site's community. If you don't already have an HonestGamers account, you can sign up for one in a snap. Thank you for reading! It's encouraging to read a more sensible review of this game, since the hype around it was as dramatic as the game's presentation. I picked it up a while ago and still can't see a good reason to get into it, but I did enjoy your review. I think it has a nice concept for a first-person game, but I think the execution is a bit underwhelming. More content and much more variation would have gone a long way with this one. As is, it nearly borders on being a demonstration more than a full product. Thanks for reading!